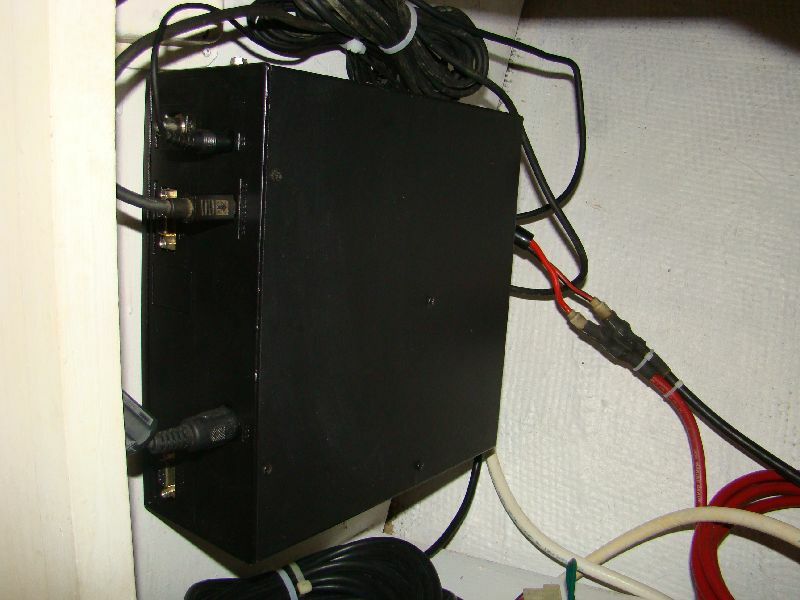 The Trawler Beach House: Is It Hard To Install A Single Side Band Radio? First, we needed to decide where the rig would be mounted. This does take some consideration since the ease of access when using the radio, the wire runs, where to mount the main unit, the automatic tuner and the ground or counterpoise connections are all factors. We chose the forward cabin as our "radio shack" because it would have the radio out of the way of all other equipment, give the operator some separation from all the other noise in the boat and give us easy access to running the necessary cables. We also chose to use the mounting brackets for the remote control head and speaker rather than flush mount them. Flush mounting would mean cutting some pretty big holes in a bulkhead and if we every decided to remove the radio or find we had to move it, we would be stuck with the holes. This is also the same area we have set up as our office and computer work station with our printer, separate hard drive storage and all of our supplies. The radio would need to be connected to the computer for retrieving email and weather information over our Winlink system, so this made perfect sense. 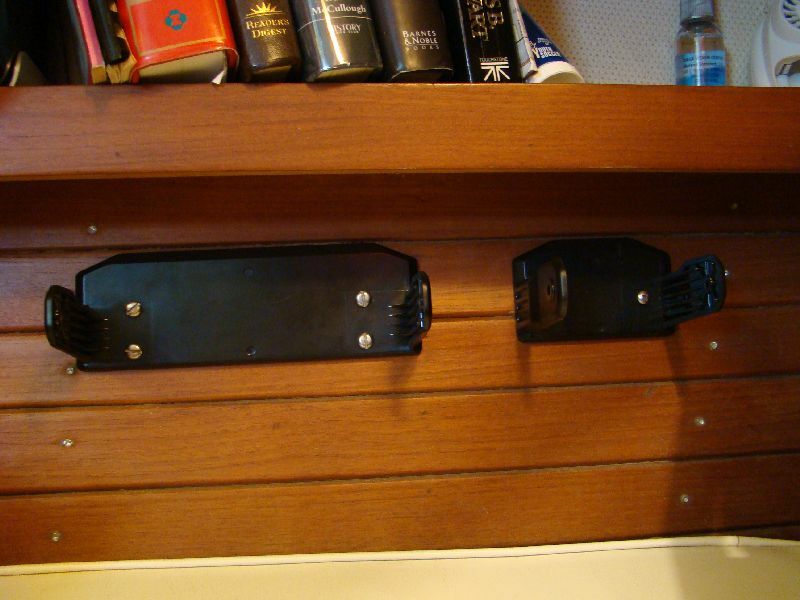 A small, one and 1/2 inch hole saw cut, through the bulkhead up in a corner under the shelf, gave perfect access to an unused compartment behind a hanging locker. The cables from the remote control head, speaker and Pactor Modem could pass through the hole with enough space to allow for the plugs on the ends. The main unit of the Icom also comes with a mounting bracket, and our choice was to mount the unit on the other side of the bulkhead. A big consideration for mounting the main unit is to be sure it is in an open and dry area. This unit is not waterproof or even water-resistant. It was within a little more than a foot from the remote control head and speaker. The cables that attach them do allow for a considerable distance if needed. One word of caution, the OPC cable that connects the main unit to the automatic tuner is not very robust. Care should be exercised so as not to damage the plugs or to pull any of the wiring away from the pins in the plugs. This is a common problem during installation. An RG 8U coaxial cable with PL259 connectors on both ends runs from the main unit to the automatic tuner. Another common problem is improper soldering of the PL259 connectors. Positive and negative wires from the main unit to a DC power source are also needed. I always run the power cables directly to the battery bank and fuse both the positive and negative wires at the battery. I have found that connecting an HF radio at the distribution panel almost always creates RF issues in other electrical equipment. The wire should be sized based on the overall run to the battery and back so that voltage drop is kept to a minimum. I don't connect the power cables until the very last, after everything is installed. All wires and cables should be well-secured so they can not chafe or accidentally disconnect. We have had the Pactor Modem cable come out on its own and it took a while to figure it out. 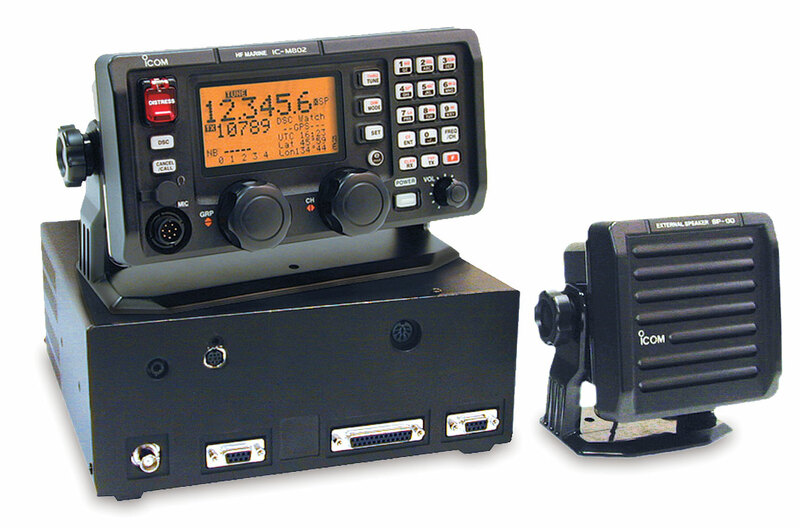 The Icom 802 requires an automatic tuner and, of course, Icom recommends their AT-140. Other cruisers we know have used other manufacturers tuners with great success. We tend to stay with what we know and we have had the AT-130 and AT-140 in the past. We also decided to try a different approach with the ground or counterpoise for this installation. This was my first install on a powerboat, so the antenna setup was a little different than past installations. 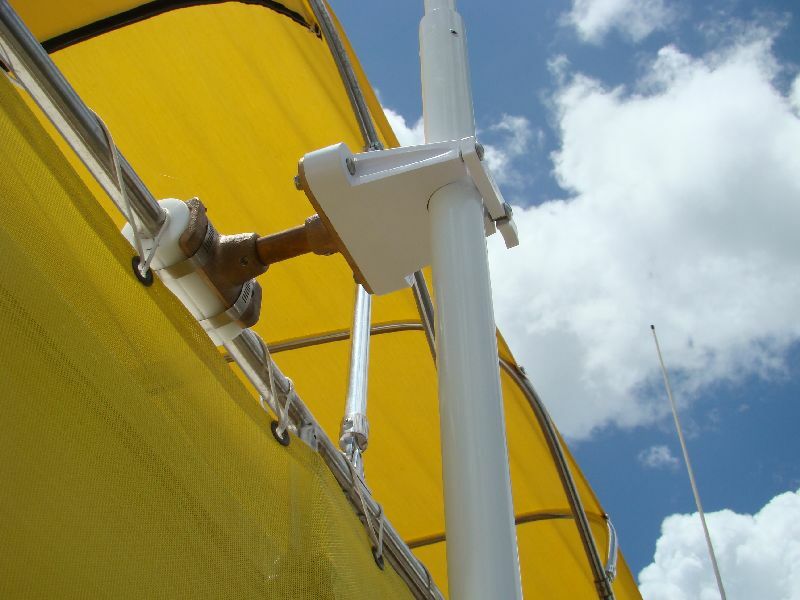 The typical SSB installation will have a copper foil strap, about two to three inches wide, run from the ground lug on the tuner to a Dynaplate and/or thru-hulls that are in contact with the water. This is how I have done our own and others installations in the past. 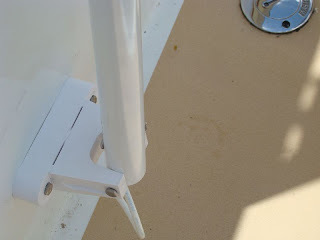 But in researching how we planned to do this on board Beach House, we found a radial-type counterpoise called KISS SSB. The reviews and feedback from others were very positive and the idea of not having to run copper straps all over the boat was very appealing. The copper straps will corrode over time and degrade the radio's signal strength. 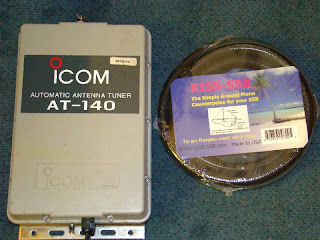 We are so pleased with the KISS SSB system that we have become suppliers and can offer them at a good discount. 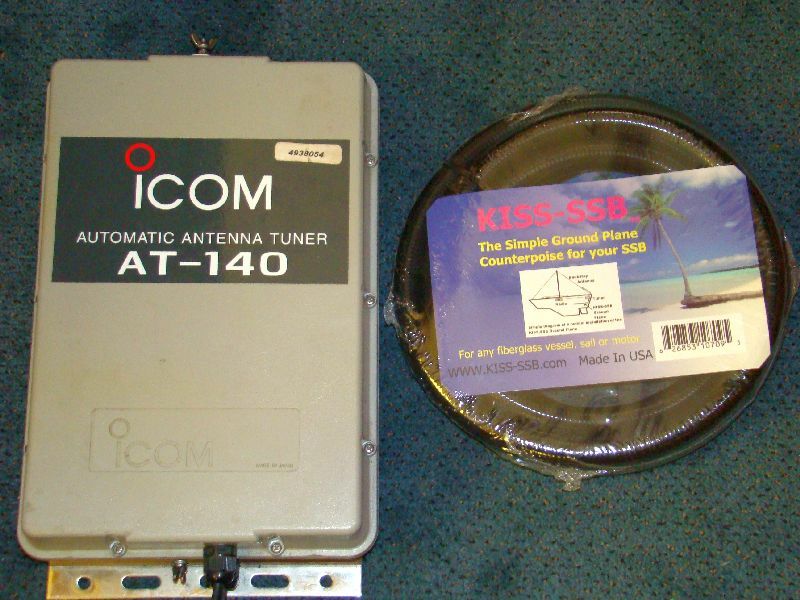 The KISS SSB is a bundle of wires designed to be radials that are connected to the tuner via a short length of wire. It is all bundled in a waterproof vinyl covering and sealed on both ends. It is a self-contained, counterpoise radial ground system. The Kiss can be run just about anywhere on the boat, clear of electrical wires and electronics, and can even be looped without affecting the performance. Our choice was to run the KISS around the perimeter of the forward V-berth and secure it to the frames just under the top. It is out of the way, but fully stretched out, without being near any other electrical items. This was almost too easy and I did not know what to expect when we finally fired up the radio. The AT-140 was mounted in the same compartment as the main unit except on the horizontal at the bottom of the compartment. This made connections between the tuner and the main unit about 2 feet, and getting to anything to troubleshoot would be easy, with all connections in the same place. In practice, all of the plugs and connections are coated with a dialectic silicone grease, and all of the coax connections are wrapped in a vulcanizing tape for added protection. An important note here: There is a green ground wire on the OPC 1147n cable, and the Icom manual tells you to connect that ground wire to both the main unit and the tuner. There is even a special lug for this. DON'T DO IT. It will cause additional noise and interference on the radio. With the remote controller, speaker, main unit and tuner all connected, it was time to work on the antenna. In the past, all of the installations I have done were on sailboats. The mainmast backstay was always used as the antenna by cutting the backstay and putting insulators near the top and bottom. The entire length between the insulators became the antenna. Since there are no backstays to speak of on Beach House, we would need to install a whip antenna. HF radio whip antennas come in two sizes; 16 feet and 23 feet. The longer the antenna, the better and we did not want to skimp on the installation, so we ordered the 23-foot whip. We also chose the Morad Antenna System after much research. You'll find the Morad on U.S. Coast Guard and Navy vessels because they are very strong and well built. Morad's website has been down for quite a while, but the antenna can be ordered directly from them by calling them in Seattle, Washington at (206) 789-2525. Ask for Ken. You will get all the information you will ever need on their units, and he will be sure you have all of the bits and pieces to install the antenna properly. Because the antenna would be sticking up 23 feet in the air, we had to give careful consideration to where it would be mounted. 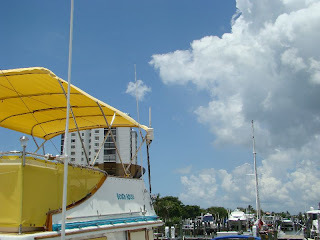 If it was placed on the side of the flybridge, it would be about 17 feet above the bimini and not exactly ideal for us. Another issue would be the run of the cable from the tuner to the antenna itself. 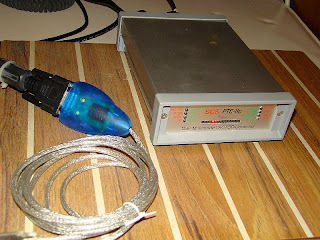 Since the radio produces high voltage to the antenna when tuning and transmitting, a special high voltage cable is needed to connect it to the tuner called GTO 15. Only the inner core wire is used and a simple crimp on connector is attached at one end to the tuner via an insulated connection and a wing nut on the opposite end from the connections to the main unit. The important factor here is that the GTO cable MUST be kept away from all other electrical wiring, panels and electronic equipment, especially autopilots. The GTO connection cable is also part of the antenna itself and puts out significant RF. For our installation, we were able to run the GTO from the tuner, behind a space along our main salon settee, to an unused open space behind the medicine cabinet in the aft head. There was also access to this space to mount the base of the antenna. The base that we purchased from Morad allows us to lay the antenna down when transiting under bridges. 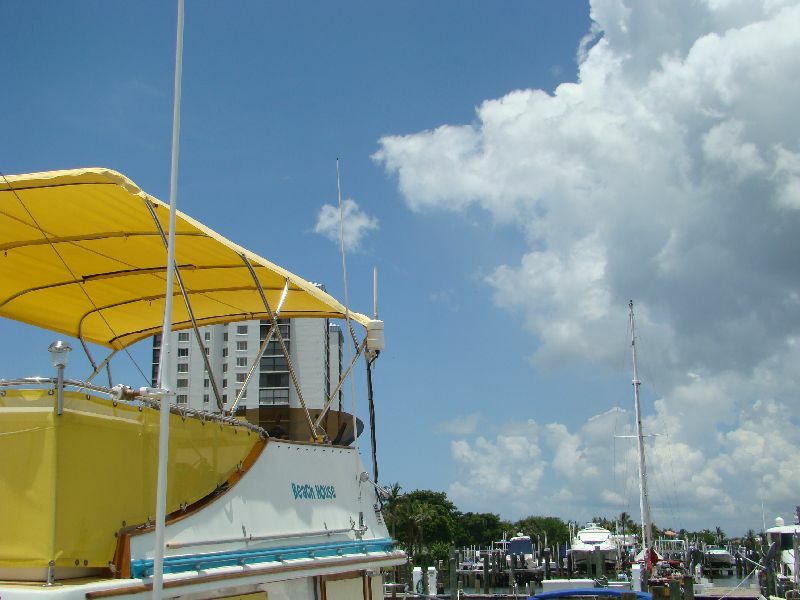 This same area allowed us to mount the antenna almost at the deck level, so it only rises above the bimini about 7 feet. It looks better esthetically and functions as it should. At 23 feet in length, an intermediate support is needed as high up as possible. Since our installation put the antenna behind the bimini frame, the next logical place was the rail at the aft end of the flybridge. The support supplied from Morad was very well made and they even made us a special attachment for the one-inch rail since the support was designed to fit a two-inch tube. This put the support at about 8 feet and made the antenna quite secure. There is a simple latch that allows the antenna to be released and lowered down to the deck if needed. We ordered the UPS version of the antenna, so named because it came in three pieces, the two longest being eight feet. This allowed us to ship it UPS without expensive extra charges. The two lower sections are powdered coated aluminum and the top section is stainless steel. The whole antenna is very well made and very robust. We don't envision any problems, even in high winds and heavy seas. With the tuner now connected to the antenna, it was time to connect the power to the radio. When the positive and negative wires are connected to the battery, you will get a spark. This is normal. One additional piece of advise for the installation. We have found that no matter how well the install, there always seems to be interference to or from other electrical equipment. Our 12-volt fans were the only culprit this time, but in the past, other equipment has caused problems. Refrigeration, alternators and most electric motors will make a lot of noise on frequency. Keeping all of the cables and wires as far away as possible will help as will connecting the power cable directly to the batteries. If all else fails, we find the clip-on ferrites can help with the noise and leaking RF. These ferrites on both ends of any cables, as close to the attachment point as possible, makes a significant difference. Attached to the power cords for fans and motors near the motor itself will help, and sometimes several will be needed. Ferrites can be found at almost any electronics supplier and should be sized to fit the wire as snugly as possible. To find the source of any interference, turn on the radio and tune it to the noisiest frequency. Then, turn the power off one at a time to each electrical source on the boat. The noise will go away as soon as you find the culprit. Then, either move some wiring or add the ferrites. With everything in place, it was time to test the rig. We were absolutely delighted that our first radio check on frequency from another boat about 300 miles away got us a "loud and clear." Since Susan is a licensed Ham operator, she has been able to check in on the Maritime Mobile Net and also received good signal reports. This is especially good since we are at the dock and broadcasting from a marina with lots of sailboat masts, a large metal building, etc. which can be problematic. 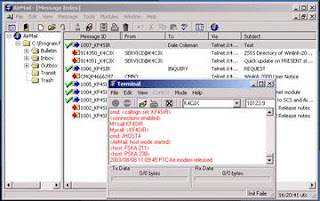 It appears that the rig and installation works as advertised and the only thing left is the connection of our Pactor Modem. The Pactor allows us to connect the Icom to our computer and send and receive emails, as well as weather fax and other weather products from NOAA that are broadcast by the U.S. Coast Guard. 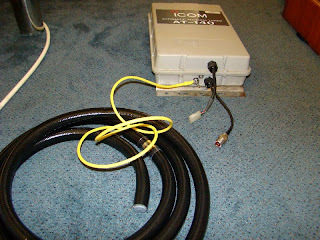 The Pactor is connected to the Icom via a special cable that is attached to the back of the Pactor and the ACC connection on the Icom main unit. 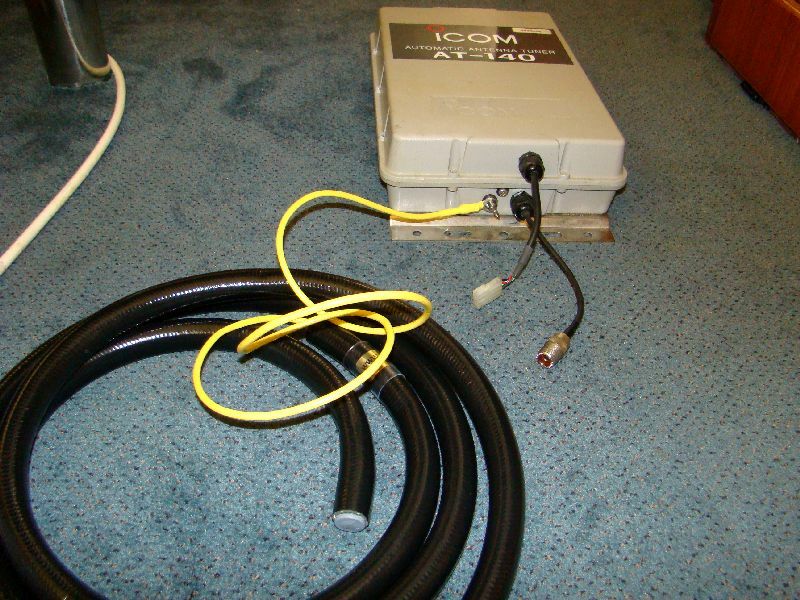 This allows the Pactor to communicate with the Icom, but another cable is needed to connect the Pactor to our computer. 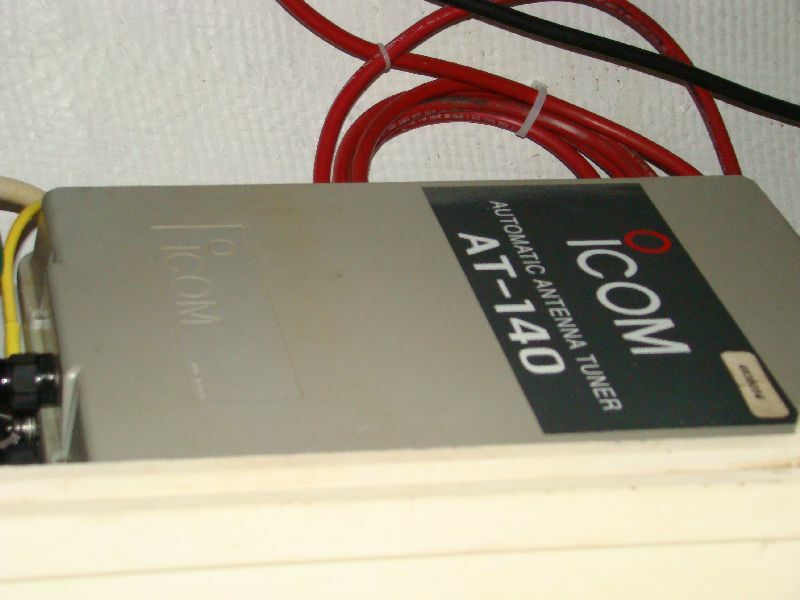 Our Pactor is an older IIe model that connects to the computer through a serial port. Since most computers today, especially laptops, don't have serial ports, we need a USB to Serial cable to make the connection. The cable must be compatible with our computer operating system and have the appropriate drivers. The newer Pactors are capable of connecting directly via USB. The Pactor and computer communicate through a great software program called Winlink Airmail. 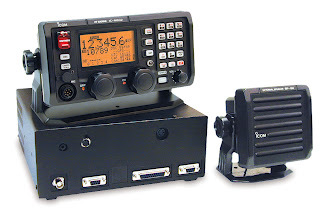 This is free to Ham operators as long as it is not used for business purposes. It will also function with a SSB through a service called Sailmail, which is a paid service. We have used Airmail for years and although it has limitations, we find it invaluable when we are in out of the way areas and need to send or receive emails from family and friends. It will also give us the ability to download weatherfax and Grib files to make our passage planning safer and more comfortable based on the weather. 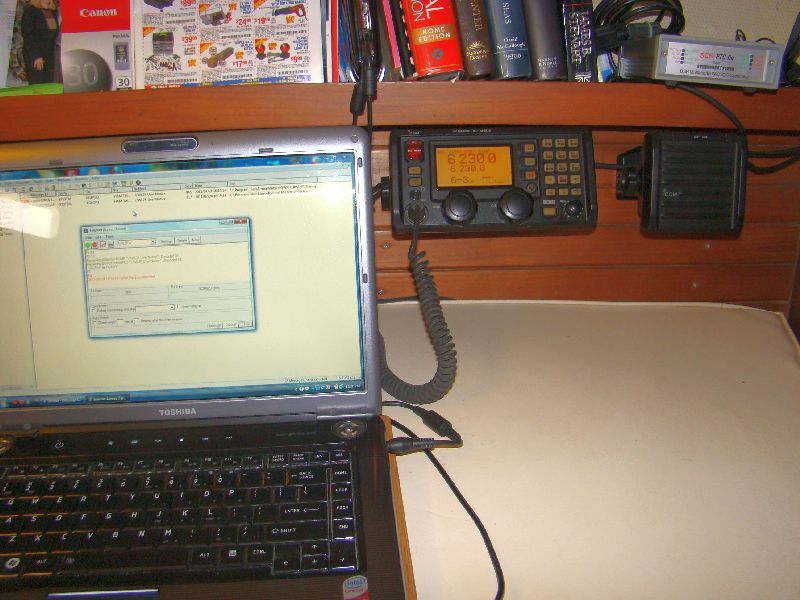 Susan like to participate in several of the SSB and Ham nets and we can even get phone patches through other Hams if we are in very remote anchorages where no other communication is available. All in all, we are extremely happy with our new installation and one more piece of equipment is checked off the list. Run by Lou, call sign KV4JC, on 7241 kHz at 1100 UTC. At 1115 UTC weather forecast from St. John (USVI). Following this report on 7086 kHz FAX, Slow Scan TV and other weather info etc. 8107 kHZ at 1330 UTC. Weather and information Caribbean coast of Panama and Colombia. An interactive high frequency radio network of cruising yachts which meets each morning on SSB 8104.0 at 1215 UTC for the purpose of exchanging information with regard to safety and security concerns while cruising in the Eastern Caribbean. More info at their website. The Maritime Mobile Service Net is operational every day from 12:00 p.m. until 9:00 p.m. Eastern Time, and from 12:00 p.m. until 10:00 p.m. Eastern Time during Daylight Savings, on a frequency of 14.300 MHz., in the 20-meter amateur band. The network also operates on the alternate frequency of 14.313 MHz. The Maritime Mobile Service Network immediately follows The Intercontinental Traffic Net. Coverage extends via relay stations to most of the Atlantic Ocean, Mediterranean Sea, the Caribbean Sea and the Eastern Pacific Ocean. just a question: with kiss is still required having a dynaplate?